Nitric acid is one of the most common mineral acids in the chemical Industry. 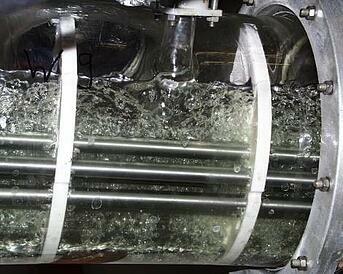 It is produced by a high temperature oxidation of ammonia with oxygen catalyzed by a platinum/rhodium contact. This results in a nitric acid/water mixture with a strength of up to almost 68 wt% nitric acid. The majority of nitric acid is used for the production of fertilizers. Other processes such as the production of explosives, pigments, rocket fuels or polyurethanes require higher concentrated nitric acid. These plants are built with highly corrosion resistant components made of borosilicate glass 3.3 and glass-lined steel manufactured by De Dietrich Process Systems. Process designs are always optimized for the utilities available at your site. Optimization and adaptation of these processes according to your feed stream and your quality specification of the product can be tested at our experimental facility. The system nitric acid / water (HNO3/H2O) displays a maximum azeotrope at about 68 wt% and a boiling temperature of 120°C at ambient pressure. In order to manufacture high-concentrated nitric acid, it is necessary to overcome the azeotrope point by using high-concentrated sulfuric acid. 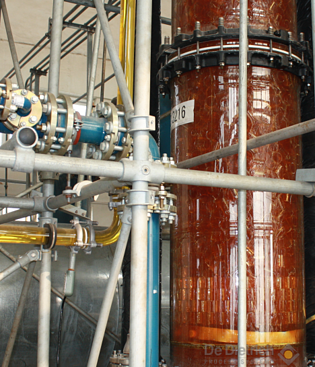 Rectification processes are used for the pre-concentration of nitric acid (HNO3) from below 55 wt%, where water is distilled to the head section and nitric acid to the bottom, up to 67 wt%. These columns are operated with minimum reflux ratio for energy saving reasons so either tray columns or glass packaging columns (DURAPACK) are used. 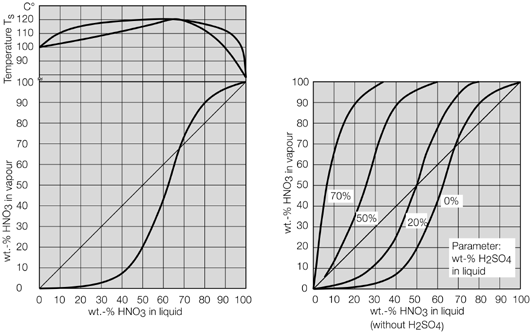 The diagrams below show the impact of different sulfuric acid concentrations to the azeotrope point. Azeotrope disappears beyond a sulfuric acid concentration of 50 wt%, yet for technical rectification, an acid concentration of about 70 wt% is recommended. 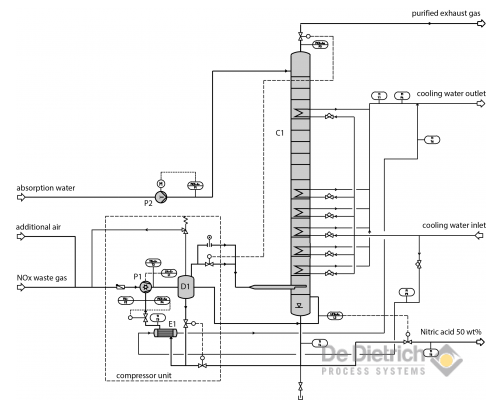 The flow sheet shows the acid feedpoints, and also the bleach column that may be needed, which strips free NOx with air from the concentrated nitric acid. The contaminated air is lead to the NOx absorption. 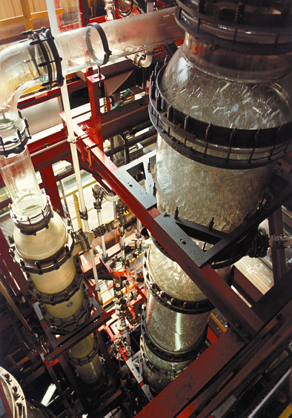 Within the nitric acid concentration unit, sulfuric acid extracts water from the bottom of the column and must again be re-concentrated. 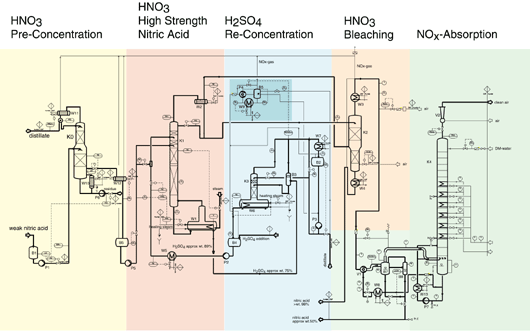 The flow chart shows the interaction of different process steps ranging from pre-concentration to high-concentration with bleach line, sulfuric acid concentration, and NOx absorption. 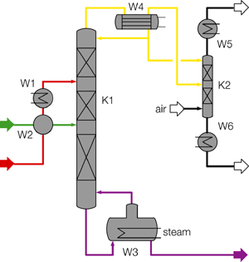 Indirect heating of the high-concentrated nitric acid by employing a horizontal evaporator. Supplementary and indirect heating performed by intermediate heaters and energy integration. Optimized inflow conditions due to preliminary mixing of the feed flows. Nitrogen oxides, also called nitrous gases or NOx-gases, are generated by many processes during the reaction and concentration of nitric acid or the combustion of fossil energy sources. NOx-gases are harmful to health but also a valuable source for the production of nitric acid. Gases with a low content of NOx that are generated during a combustion process are mostly converted with ammonia via catalyzed processes into nitrogen and water. In the case of higher NOx concentrations, the gases are mostly guided through aqueous absorption columns where the aim can be to remove or scrub the NOx from the waste gases and/or to produce nitric acid. 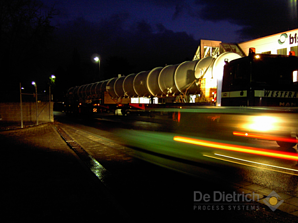 Scrubbers are custom designed and built by De Dietrich Process Systems as per your needs. If oxygen is not present and the scrubber is operated with an aqueous non-oxidizing media such as water, the NO of the NOx will pass the scrubber while other NOx are dissolved as nitrous and nitric acid or nitrites and nitrate under caustic conditions. When adding oxygen the NO will be oxidized in the gas phase to NO2 to become nitric acid and is dissolved in water which is the common way to produce nitric acid. When adding oxidizing agents to the liquid phase as hydrogen peroxide or potassium permanganate nitrites are oxidized to nitrates improving the scrubbing process. 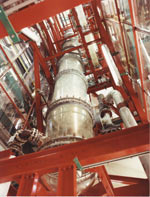 These semi-batch operated absorption systems are commonly provided by DDPS when periodically operated processes as the dissolving process of metals with nitric acid generate the NOx-waste stream. With oxygen (as is present in air) the conversion of NOx into nitric acid can be accomplished in a quantitative manner advantageously at a higher pressure, which is basically also the common method for the syntheses of nitric acid based on the ammonia oxidation. 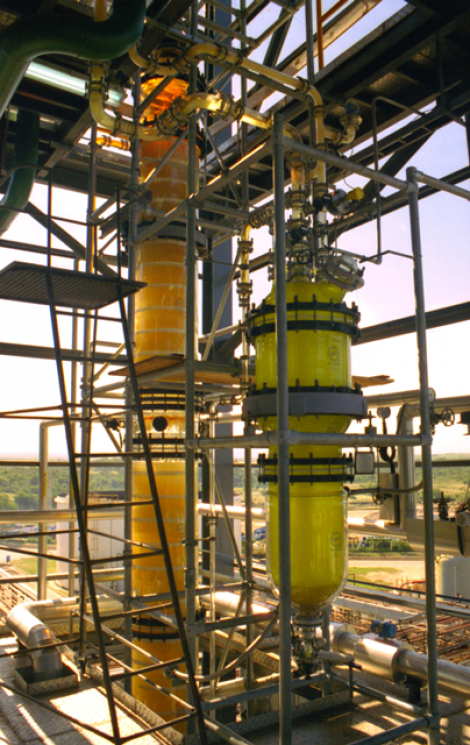 DDPS typically supplies such continuously operated NOx-Absorption towers along with nitric acid concentration plants to reduce NOx-emissions below regulated values and to improve the efficency of the overall nitric acid concentration process. 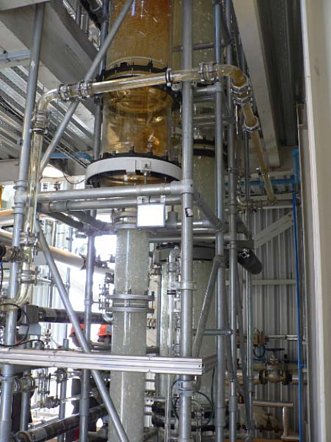 The NOx gases coming from the extractive rectification column to produce high concentrated nitric acid are mixed with air and pressurized by a liquid ring compressor into the bottom of a stainless steel absorption column whereas water is introduced from the top of the column. The oxidation of NOx is quite exothermic so it is necessary to remove the heat as good as possible to increase the conversion rate and concentration of nitric acid. Since this heat removal is crucial for the conversion rate, De Dietrich Process Systems has developed column trays with integrated cooling loops. 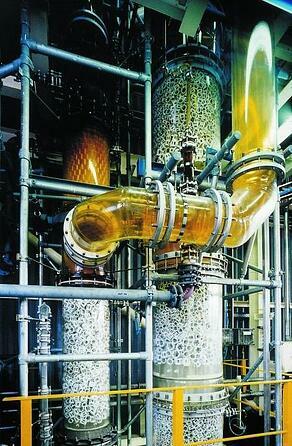 The generated nitric acid leaving the column at the bottom has a concentration of about 50-65 wt%. The vent gas leaving the column at the top meets the specification of the EPA or even lower. 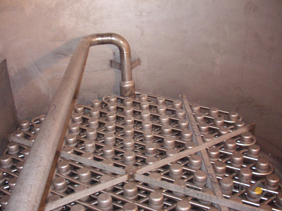 Heat removal in the column is a significant issue due to the exothermal reaction; to solve this problem, DDPS installs specially designed cooled trays. 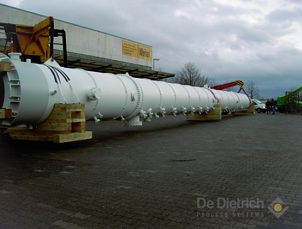 One of the largest NOx pressure absorption columns that De Dietrich Process Systems has built weighs 41 metric tons, has a height of 115 ft and a diameter of 75 inches. Reference plants can be found around the world.